Sahag Bartev was the tenth Catholicos of the Armenian Church for a period of almost fifty years, with interruptions, but this was not the main reason he was sanctified by the Armenian Church. He was born on September 29, 348, and was the son of another important Catholicos, Nerses the Great (353-373); his mother belonged to the Mamigonian family. The first Catholicoi were all descendants of St. Gregory the Illuminator. Some of the Catholicoi had been married and had children before consecrating to religious life; their wives would leave world life afterwards and become nuns. The future head of the Church was educated in schools in Caesarea, Alexandria, and Constantinople. He knew Greek, Syriac, and Persian. He was elected Catholicos in 387 and worked actively with king Khosrov IV to restore the unity of Greater Armenia, which had divided between the Persian and Byzantine empires in the same year. After the dethronement and exile of Khosrov III (388) by the Persian king, Sahag I was also deprived of the patriarchal throne in 389. The efforts of the next king, Vramshabouh (388-414), who was Khosrov’s brother, made it possible to restore the Catholicos in his position. Sahag Bartev had a fundamental role, together with Vramshabouh, in supporting the work of St. Mesrob Mashdots that led to the invention of the Armenian alphabet at the beginning of the fifth century, as well as to the creation of a school network to teach the new alphabet and the cultural work that created the Golden Age of Armenian literature in that century. Historian Ghazar Barpetsi wrote that Mesrob Mashdots and the other translators, whenever needed to make any phonetic comparisons between the Armenian and Greek languages, took their questions to Sahag I, because he had received a classical education and had a comprehensive knowledge of phonetics and rhetorical commentary, and was also well versed in philosophy. Sahag I worked to arrange and organize the Armenian calendar of religious festivities. He wrote many rules related to the ecclesiastic and secular classes, the officials, marriage, and other issues. He composed various liturgical hymns and prayers, and he played a significant role in the translation of the Bible, which was completed in 435. 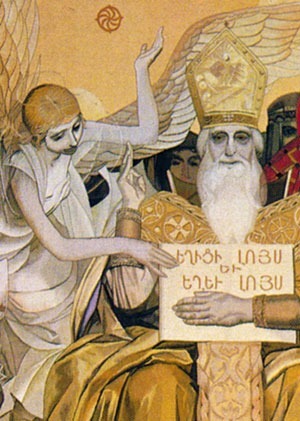 The Catholicos wrote polemical letters against various sects, as well as letters to the Byzantine emperor Thedosius II, the Patriarch Proclus of Constantinople, bishops, and a Byzantine governor. In these letters, the Catholicos, together with Mashdots, presented the orthodox position of the Armenian Church after the Ecumenical Council of Ephesus (431). The letter to Proclus, in particular, was read at the Council of Constantinople (553), after the letter of Cyril of Alexandria, as proof of orthodoxy. Sahag Bartev passed away on September 7, 439, in the village of Pelrots, in the province of Pagrevant, and was buried in the city of Ashtishat, in the region of Daron. With his death the line of St. Gregory the Illuminator came to an end. The Armenian Church remembers Sahag Bartev’s memory twice a year. The first on the Saturday eight days before the Great Carnival (Paregentan), between January 24 and February 28, and the second on the Thursday following the fourth Sunday of Pentecost (between June 1 and July 16), when he is remembered along with Mesrob Mashdots as the Holy Translators.